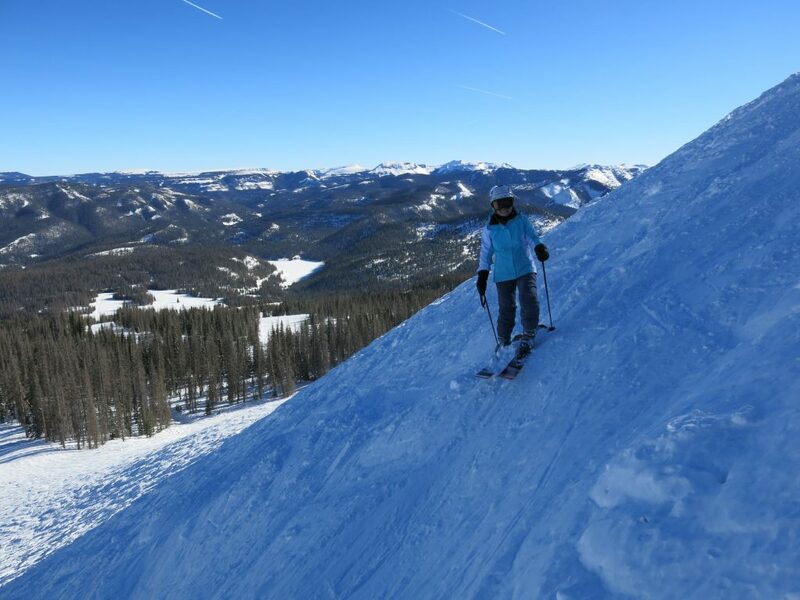 Wolf Creek is located in southern Colorado in one of the snowiest areas of the state. 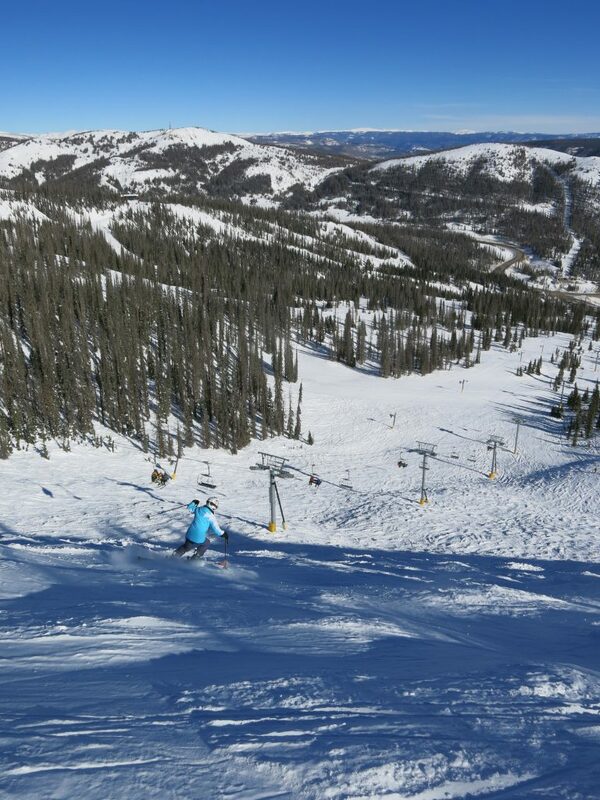 The snow falls early and deep, so Wolf Creek often has the deepest snowpack of any resort in the US before Christmas. 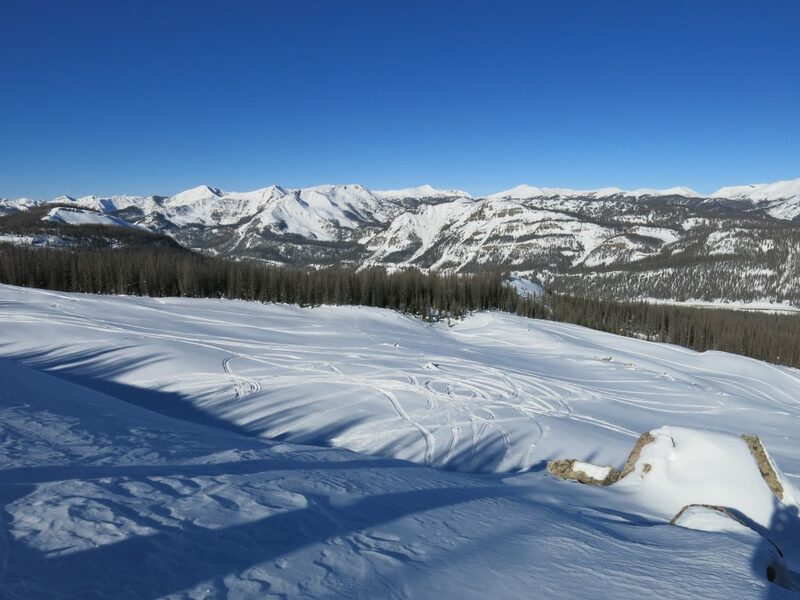 It’s far away from any major population centers or airports, so you need to be motivated by powder to make the trip. 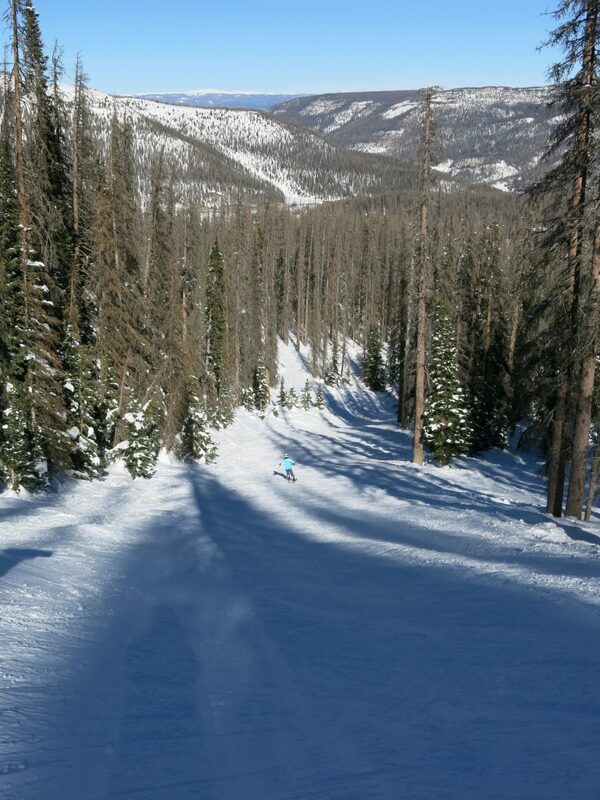 I started skiing Wolf Creek back in the 80’s when I was growing up in New Mexico. We made a few trips up there when snow at Taos wasn’t that good. Wolf Creek always seems to reliably get snow year after year even when the rest of Colorado and New Mexico was dry. When we finally visited together it had been about 25 years since my last visit and I had a hard time reconciling my memories of the place with the reality. Maybe it was because we had just skied Taos the day before, or maybe I’ve gotten a lot better or equipment has changed the way I ski now, but the place seemed way too flat for the most part. Yes, it has the Waterfall area which is a collection of double-black chutes and narrow lines through the trees, but that area is very small and only has a few hundred feet of vertical followed by a long flat runout to the base of the Alberta chair. The rest of the ridge is unimpressive and you can pretty much subtract a full rating from each trail. Blues are really green and blacks are really intermediate. On a powder day I wonder if you could even find enough momentum to make turns on most of the terrain — it’s that flat. 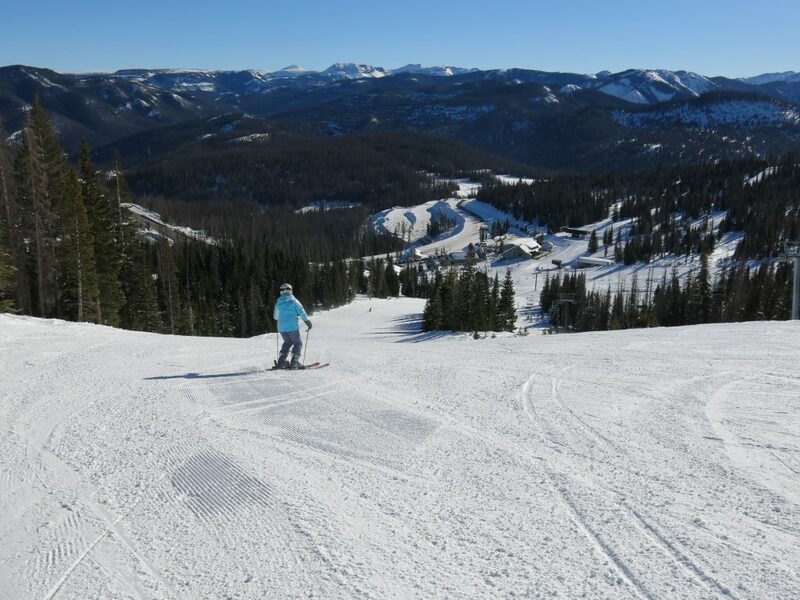 When we skied there in mid January, they had received over 269″ of snowfall already so coverage was complete and excellent. However, it was abnormally warm for mid January at over 11,000 feet and it had iced up. It was still skiable off-piste, but only in the shade which means north-facing or deep trees. Given the reality of the terrain and snow, we spent a lot of time searching for challenge in the morning. The only place we found it was the Alberta Face and Holy Moses right off the top of the Treasure Stoke lift. Yes, there were some nice easy groomers off Bonanza and Raven and some easy bumps, but we were looking for more. The base lodges and restaurants at Wolf Creek are old and a bit run down but this is typical for small areas of this type. The lunch food was typical as well, with ski area cafeteria fare. We were pouring over the trail map at lunch looking at all the black runs off the Alberta chair so decided to head over there after lunch. The Alberta chair wasn’t there 25-years ago so this was new to me. It looks good on the map but the reality was a bit of steepness at the top and another bench in the middle followed by a long runout at the bottom. The chair is long and slow. We did enjoy Bankshot and Gyro, but we were generally underwhelmed and stopped skiing at about 2PM to get an early start home to Albuquerque. I have to mention that the best part of our trip to Wolf Creek was actually staying in the historic Windsor Hotel in Del Norte https://windsorhoteldelnorte.com/. We were some of the only people in the hotel but it was really quite nice with a lot of history that we appreciated. It was one of the most memorable places we have stayed while on The Project. Sorry to fans of Wolf Creek but no we won’t be back. 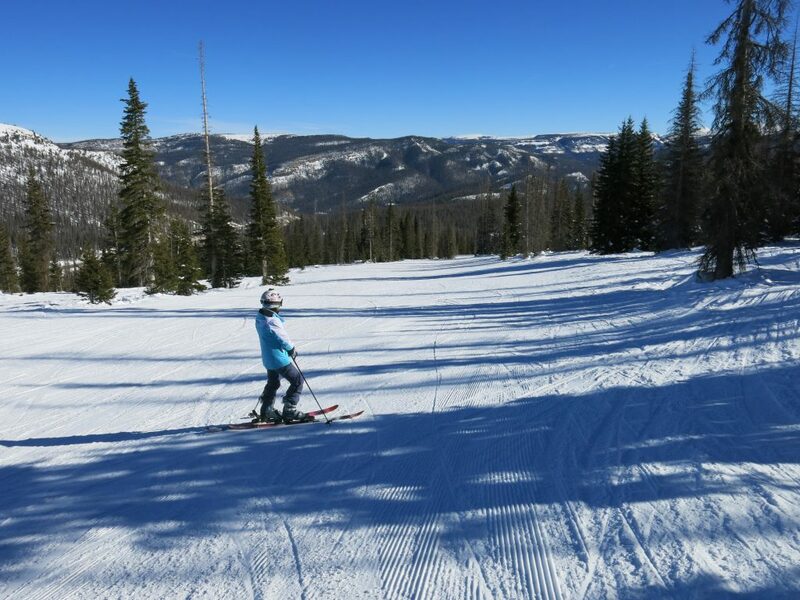 The other resorts in the region Purgatory and Taos are so much better there is no real reason to make another trip there. It’s a great resource for locals from Alamosa or Del Norte, but not so much as a destination resort if you are travelling.